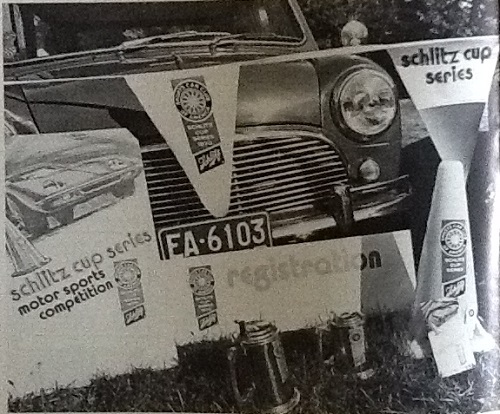 Westport: Conn., June 12, 1970 - The Joseph Schlitz Brewing Company and the Sports Car Club of America (SCCA ) announced today the Schlitz Cup Series of auto sports events for the low budget enthusiast. 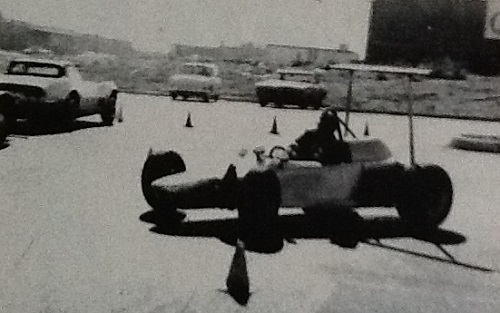 Ninety slalom events--one-car-at-a-time-against-the-clock tests of driving skill—are included in the 1970 series. For the first time, support for this type of event, called Solo II by SCCA, will be on a uniform, nationwide basis. Thirty SCCA regions are sharing in the series of slaloms, sutocrosse and gymkhanas. The first of the 90 events is scheduled for June 14 at Illiana Speedway, Merrillville, Indiana, organized by SCCA's Indiana Northwest Region. Each of the 30 participating local regions jointly selected by SCCA and Schlitz will present three of the events between now and the end of October. Competitors will be trying to win Schlitz Cup awards in 10 classes. Solo II competition is one of the most widely enjoyed forms of auto sports. Entries frequently run into the hundreds of cars per event--mostly sports cars and small sedans driven daily. Harry M. Handley, SCCA director of solo events said here, "This is a tremendous break through for thousands of auto sports people who can benefit from a national program of support and promotion. And the extent of Schlitz' support in sheer numbers must be unprecedented in American auto sports. It includes 2,790 awards, 10,000 plaques and emblems, 10,000 copies of the rules, 900 pylons,and 30,000 feet of pennants. In addition, an advertising and poster program will support the Schlitz Cup Series." 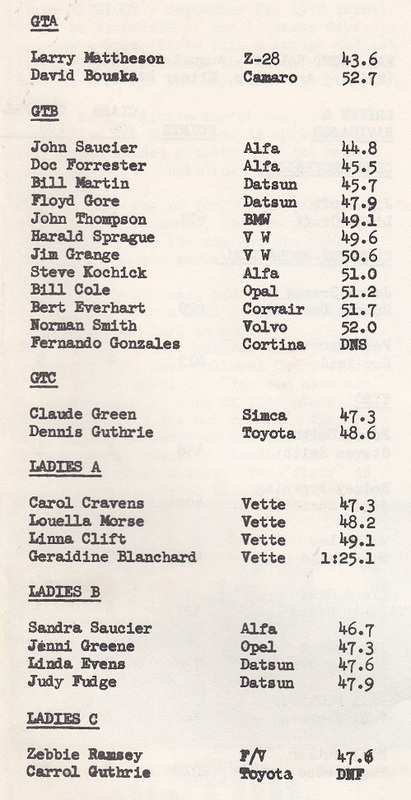 Schlitz and SCCA view the 1970 Schlitz Cup Series as a forerunner. Both believe the unique support program can lead to the establishment of an expanded series, including possible national championships for this type of automotive competition. 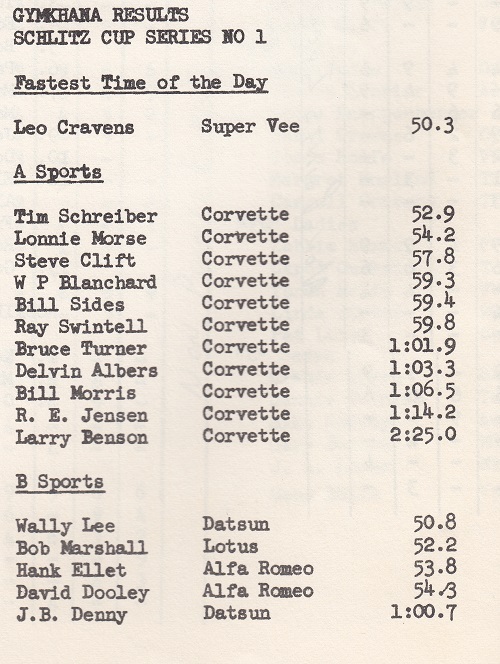 The SCCA regions taking part in the 1970 Schlitz Cup Series on an invitational basis are: Arizona Border, Arkansas, Atlanta, Black Hills, Central Carolinas, Central Kentucky, Central Louisiana, Chavaga, Chicago, Colorado, Des Moines Valley, Eastern Tennessee, Glen, Great River, Indiana Northwest, Kansas City, Las Vegas, New England, Ohio Valley, Oklahoma ,Old Dominion, Pan American, Reno, Rio Grande, San Diego, Tennessee, Tennessee Valley, Texas,Washington D.C., and Western Ohio. Seventy drivers and several hundred spectators gathered at Arlan's Department Store (South) on August 30th to make the inaugural Schlitz Cup series, Solo II gymkhana a rousing success. This, the first of three such events to be sponsored locally by the Joseph Schlitz Brewing Co. is being duplicated in twenty-nine other SCCA regions across the country and is a good indication of the growing interest in all phases of motor sport competition. The Schlitz Co. furnished thirty-one beautiful pewter mug trophies, dash plaques for all contestants, pylons and hundreds of feet of flagging. A bonus was the generous supply of cold beer (Schlitz, of course) made available at the trophy presentation by the local Schlitz Representative, Mr. A. Truitt. At the end of a 90 plus degree August afternoon what could be more appreciated? Co-chairmen Paul Grounds and J.A. Looper had the gymkhana well organized with a fast, challenging course laid out which demanded each drivers' utmost attention if penalties were to be avoided. Fastest time of the day went to Leo Cravens in the X-class Super Vee who sped around the course in 50.3 seconds. 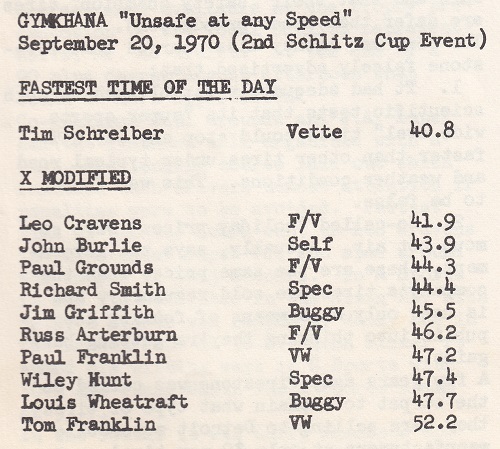 In A Sports it was Tim Schreiber in the Sting Ray with 52.9. 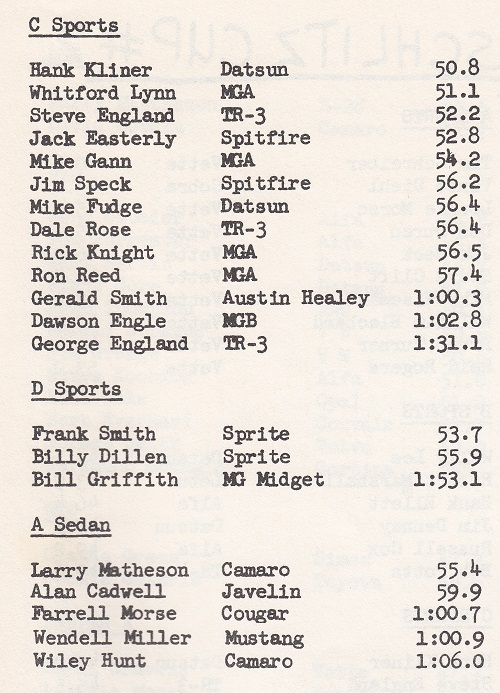 B Sports was capped by Wally Lee in the Datsun 2000 at 50.8. Hank Kliner resumed his winning ways in C Sports with 50.8 and Frank Smith was D Sports champ at 53.7. 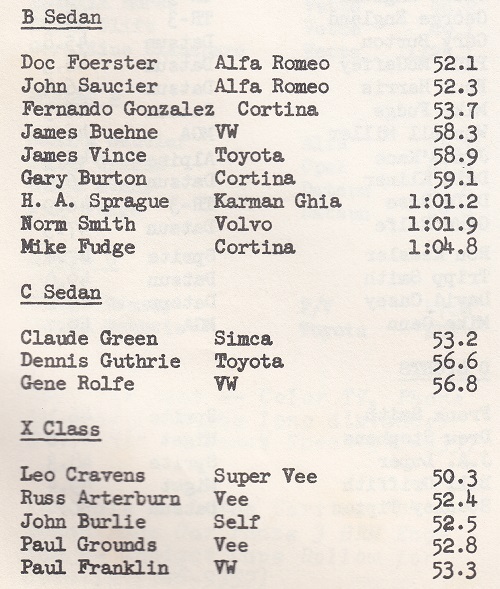 In the sedans it was Larry Mattheson and Z-28 for a 55.4 in class A; Doc Foerster had 52.1 in his B class Alfa and Claude Greene with 53.2 garnered the C class win in the Simca. 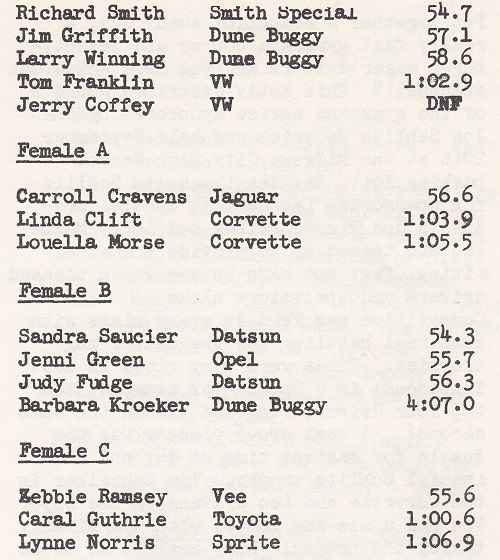 An unusually large group of girl-type drivers entered and in ladies Formula A Carol Cravens won with 56.6 in the Jaguar. Sandy Saucier driving a Datsun 2000 led B with 54.3 and Zebbie Ramsey clocked 55.6 to take ladies C class in her Formula Vee. A special vote of thanks must go to the Arlan's people who were most cooperative in furnishing their parking lot and who also furnished six merchandise prizes given away by a special entrants drawing. Thanks also to the local press, radio and TV folk for all the publicity, particularly Bill Allen sports director cf KOTV, a real sports car booster. With all of these helping it was truly a week-end to remember. and set the stage for round two of the Schlitz Cup series which will be held September 20 , 1970 at the Midwest City High School Parking area. Put together a beauttful sunny day, a really fast gymkhana course and seventy-three eager drlvers and you have – instant success !!! This aptly describes Round 2 of the gymkhana series sponsored by the Jos Schlitz Co which was held September 20th at the Midwest Clty High School parking Iot. Besides thanks to Schlitz for sponsoring the series, special credit is due Tim Schreiber and Larry Mattheson who teamed up to provide a most exciting, fast but safe course which pleased drivers and spectators alike. The results of Schlitz Cup Series III will be covered in a future Gazette story covering the 1970 Octoberfest. Sadly the series lasted only one year, but Handley's prediction about National Championships became true and lasts to this day.